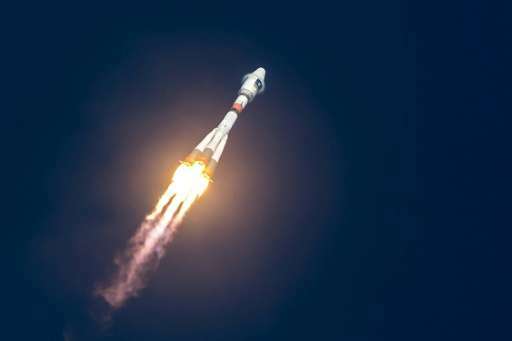 For months, the European Space Agency—which runs the programme—has been investigating the reasons behind failing clocks onboard some of the 18 navigation satellites it has launched for Galileo, Europe's alternative to America's GPS system. Each Galileo satellite has four ultra-accurate atomic timekeepers, two that use rubidium and two hydrogen maser. 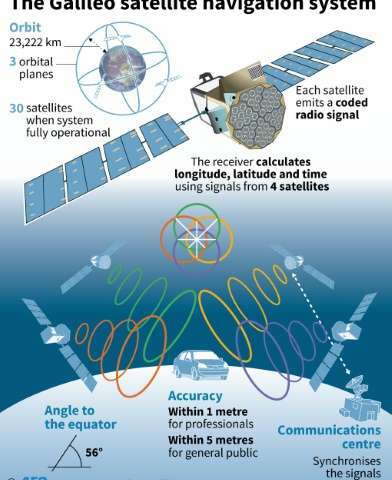 But a satellite needs just one working clock for the satnav to work—the rest are spares. Three rubidium and six hydrogen maser clocks were not working, with one satellite sporting two failed timekeepers. "The main causes of the malfunctions have been identified and measures have been put in place to reduce the possibility of further malfunctions of the satellites already in space," commission spokeswoman Lucia Caudet said. ESA found after an investigation that its rubidium clocks had a faulty component that could cause a short circuit, according to European sources. The investigation also found that operations involving hydrogen maser clocks need to be controlled and closely monitored, the same sources said. The agency has taken measures to correct both sets of problems, the sources added, with the agency set to replace the faulty component in rubidium clocks on satellites not yet in orbit and improve hydrogen maser clocks as well. "The supply of the first Galileo services has not and will not be affected by the malfunctioning of the atomic clocks or by other corrective measures," Caudet said, and that the malfunctions have not affected service performance. The Galileo system went live in December last year, providing initial services with a weak signal, having taken 17 years at more than triple the original budget. The civilian-controlled service is seen as strategically important for Europe, which relies on two military-run rivals—GPS and Russia's GLONASS. ESA boasts that Galileo has the most accurate atomic clocks ever used for geolocalisation. Similar to traditional clocks relying on the tick of a pendulum, atomic timekeepers also count regular oscillations, in this case switches between energy states of atoms stimulated by heat or light. But Galileo has experienced many setbacks, including the placement of two satellites in the wrong orbit. In January, ESA director general Jan Woerner announced that the system had suffered a setback with its atomic clocks. The EU Commission expects Galileo to be fully operational by 2020. ESA signed a contract in late June with a German-British consortium to build eight more satellites for Galileo, which will eventually comprise 30 orbiters. Once fully deployed, Galileo aims to pinpoint a location on Earth to within a metre—compared to several metres for GPS and GLONASS. Clients of a paying service will be able to receive even more accurate readings—down to centimetres. Such accuracy will be very useful in search-and-rescue operations. All new cars sold in Europe by 2018 will be fitted with Galileo for navigation and emergency calls. Its high-precision clocks will also boost synchronisation of banking and financial transaction, telecommunications and energy smart-grids, making them more efficient. It should also boost the safety of driverless cars. Anonymous faulty components found and 'measures' put in place. Another triumph for managerial spin over an actual engineering problem and its solution. Let's have another ten meetings about it, and award another pay rise for the upper tier managers. Question: what alternative do you expect? What kind of announcement would not sound like 'spin' to you? Satellites are complicated products with thousands and thousands of components from third party manufacturers. No, it isn't possible to test every single one for all eventualities (or manufacture all yourself to your own standards). Even if you could there's still stuff that can happen in an integrated system that is not foreseeable. The tests are pretty stringent - but testing every eventuality is impossible. I don't know a single complicated technical object where some fault *wasn't* detected after shipping. Sometimes it isn't a problem. Sometimes you can fix it with a software patch. Sometimes you have to recall. Sometimes you replace and fix it in the next version. None of this is 'spin' or unusual. That's just how real life works. I don't mind the spin as long as it includes more elements of a technical nature. This is a physics website and I'm an engineer. I've been to enough meetings to know they can be useful, But I've also seen egocentric managers pat themselves on the back in the good times and blame someone else when their shuttle blows up or their high-rise homes burn down. We give such management structures too much self-praise publicity and pay rises as it is. I'm as critical of managers as the next guy (heck, I'm an engineer, too, and have to fight with them on a daily basis). But in the above I can't really find any smug attitude. They announced that they finally found the problem and think they know how to fix it/prevent it from happening in future satellites. That's basically anyone who wants to build applications based on GALILEO signals needs to know. Communicating this is a manager's job. "all seem to have a consistent signature, linked to probable short circuits, and possibly a particular test procedure performed on the ground." So it might be that testing *too* much (or testing with a hazardous procedure) might have caused the issue. At some point stress tests produce...stress. Thanks for the research. Why cant we see more of that info in Phys org. I would have learned more if this item had named the faulty component or the over zealous testing regime that 'probably' caused the fault. (I hope and assume an engineer test-replicated the failure condition.) Its information like a shorting out heater, or burned oxygen tank stirrer, or a brittle rubber gasket, or a flammable building cladding which if published actually stops it happening again. The rest of this article is the managers doing their job. Worthy of a two inch article at best. Well, the way I read it the results are "we *probably* found the reason why it failed". It's sorta hard to be sure because they can't well get a failed satellite into the shop to have a look. At this point the best they can do is fix the issue they think is relevant, shoot up another couple satellites and see if it happens again. If that's the best they can do then they had better swap out all the suspect components, cross their fingers, and have some extra strong management spin on standby. What else would you do? You can't include test circuitry for all circuitry (for weight reasons but also see below). Test circuitry can create false positives - at some point you'll do more harm than good (overtesting). So you do screening of all women which finds these X% but also Y% false positives (as well as creating Z% new, lethal cancers due to radiation used in screening). In both the X% and Y% cases you operate as you can't distinguish them - but there is a W% chance that an operation will result in lethal complications. If Y*W + Z is greater than X you've actually worsened the problem as more people die than would have if you'd done absolutely nothing. The granularity of the testing and sub-component isolating has to be a statistical balancing of extra weight and extra failure modes against useful extra information from a bit of faulty gear you cant bring back but costs a fortune to repeatedly send up into a duff condition. That's why they have multiply redundant clocks on these satellites. Having a working one - even if some clocks fail - is preferrable to having less clocks (and potentially a dead satellite) but some more information about why it fails. I think they're well aware of the tradeoffs and the choices of what to include (and what not to include) on a satellite is not arbitrary. There is also a bit of an unknown factor, as you don't have good statistics of how many clocks will fail in advance. From an engineering standpoint I'd say they are doing what is sensible - both in what they shot up there and the actions they are taking now. They should all work, at least initially. With failover only expected after the MTBF of any unit. If you let initialisation failures continue (And I know they have a crossed fingers plan to mitigate this..which may well succeed) after the MTBF your satellite may become a brick in space.